Huge losses in bee populations began to happen in 2005 & 2006. The term 'Colony Collapse Disorder' was coined for this alarming situation. Worldwide researchers began to identify Neonicotinoids as the chief suspect. These are a relatively new class of nicotine based insecticides that affect the central nervous system of insects which result in paralysis and death. European countries banned their use in 2013. The United States has yet to do so. In October of this year, seven species of yellow-faced bees native to Hawaii, were placed on the endangered species list. The Rusty-Patched (or Rusty-Faced) bumblebee of the eastern United States was also named to be added to the list. It is a main pollinator of cranberries. This list is only a part of the fruits and vegetables that bees pollinate; avocados, apples, mangos, peaches, plums, guavas, citrus, okra, strawberries, macadamia nuts, cashews, coconuts, starfruit, broccoli, cauliflower, carrots, cabbage, Brussel sprouts, eggplants, tomatoes, grapes, raspberries, blackberries, bell peppers, watermelon, figs, and coffee. Without bees, 30% of the world's food crops would fail. Imagine your dinner plate without 30% of your favorite foods. What can we do? We can help by planting for the bees. We have observed the bees for years here at SmartyPlants. 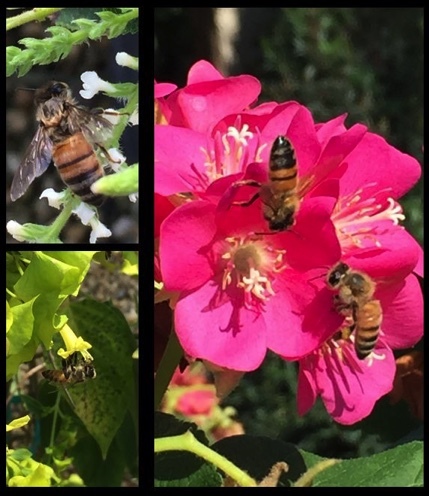 Here are plants you can add to your garden that we know bees love; Jatrophas, Durantas, Florida Hydrangeas, Sweet Almonds, Shrimp plants, Jasmines, Flame Vines, Heathers, Buttercups, and annual plants like Salvia and Snapdragons. Our seed packets "Save the Bees" is also a popular addition. Lastly we can avoid using systemic insecticides in our own gardens. Systemic insecticides enter all the parts of a plant from the roots, stems, leaves, and ultimately flowers where the nectar is found. Use bee friendly methods of insect deterrents like insecticidal soaps, blasts from water from your hose, or organic sprays like neem oil or Organicide. The bees will thank us and we most certainly will thank the bees. As always at SmartyPlants, we have some unique gift items that can't be found elsewhere. Whether you need a present, an expression of appreciation, a hostess gift, or just an unusual gift we have something to fit the need. We have re-stocked our supply of creations by SmartyPlants. This includes saucers or bowls of cacti and succulents, driftwood adorned by tillandsias or bromeliads, numerous hanging baskets of assorted foliage plants, and unique containers like snail shells holding airplants and ferns. Each of these are custom made and eye-catching. Our plants growing in mossed balls remain a favorite. Requiring only a good soaking once a week, these always get your attention. If you only need a poinsettia for the holidays, we have those, too. Our Campo De Fiori line of pottery will also be on sale after Thanksgiving on Friday, Saturday, and Sunday. They will be 25% off! Our anniversary was on November 2nd. We are now going into our seventh year at SmartyPlants! Many of you have been customers since 2010. Our customer base as well as our inventory has continued to grow proportionately each year. Paul, Marta, and the staff at SmartyPlants wish to give a big 'Thank you' to each of you. It says a lot when new first timers come in and say a friend told me to come here. 'Word-of-Mouth' is the best form of advertising. We are thankful to you all.